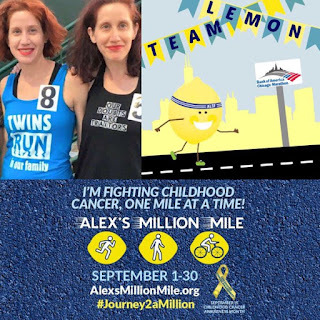 On March 17, 2012, my identical twin, Leah, and I joined Team Lemon to support Alex's Lemonade Stand Foundation for Childhood Cancer in memory of Leah’s brother-in-law, Michael. On July 16, 2012 our grandmother, affectionately known as “GG,” died suddenly. Over the past four years we have raised awareness and nearly $3,000 for childhood cancer research in memory of Michael and GG. 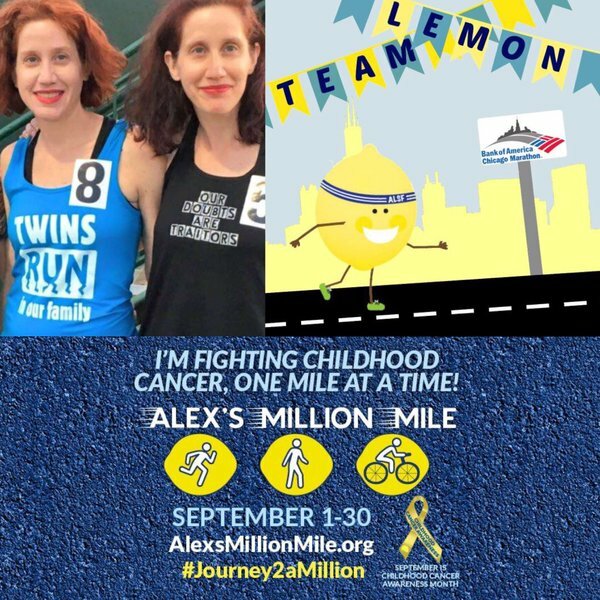 We've also shared our experiences running together to support Alex’s Lemonade and other causes we care about on our blog, "Twins Run in Our Family," Twitter, Instagram and Facebook. Much to our surprise, we've gained a following of runners, twins and/or parents of twins. We're often recognized at races when we wear our shirt that has our logo on the front and our tagline on the back: "If you're passing me, I'm Malinda. If I'm passing you, I'm Leah." Over the years, I've struggled with chronic illness and depression. Because of my experience, I'm truly grateful for every step and I'm determined to make my miles matter. 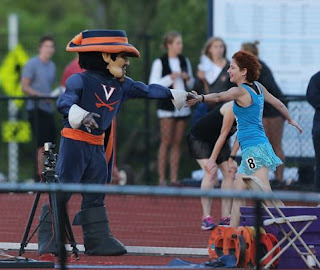 I'd rather run in a charity race to raise awareness for a worthy cause than run a fast time. Sometimes, much to my surprise, I'm able to do both. Virginia Challenge Day 2 (by Kelsey Grant and Matt Riley).